The language of economic development: "Greater Bay Area"
The development plan for the Guangdong-Hong Kong-Macao Greater Bay Area (粤港澳大湾区发展规划纲要) was published yesterday. It contains lots of interesting material for economic geographers, but it was my early training in physical geography that first kicked in: Is “bay” a fitting description for the region? I jumped down a rabbit hole into the world of coastal geography. Came out with lots of fun facts (the United Nations Convention on the Law of the Sea provides a legal definition for “bay”!) and strengthened in my belief that policy objectives rather than coastal morphology inspires the terminology. At midnight the day the plan was released, Global Times wrote: “China on Monday released a grand plan for the development of the Guangdong-Hong Kong-Macao Greater Bay Area, aiming to build a global economic and technological powerhouse in the country's south region that could be on par with bay areas in New York and San Francisco” (emphasis added). 24 hours later, Global Times raised the bar: “With a combined GDP of $1.5 trillion in 2017, [the Guangdong-Hong Kong-Macao Greater Bay Area] is on track to surpassing the world's three existing major bay areas - San Francisco, New York and Tokyo - to become the world's most vigorous and largest bay area by economic output, analysts said” (emphasis added). The strategy is devised at the national level, according to Xinhua by Chairman Xi himself: "It is a national strategy General Secretary Xi Jinping has planned for, made decisions about and promoted in person." The plan and the change in vocubulary are relevant to some of the key questions in BROKEX: What does the plan say about the role of the Pearl River Delta region in national development strategies? Does it imply less autonomy for local governments in devising development strategies? How does the plan condition how actors in the PRD engage with the rest of the world? Figure explanation: Google hits on the phrases “粤港澳大湾区” and “珠三角” by 1 January each year. The last count plotted, where “粤港澳大湾区” surges, is from a search 20 February 2019, 9:00 a.m. Beijing time. 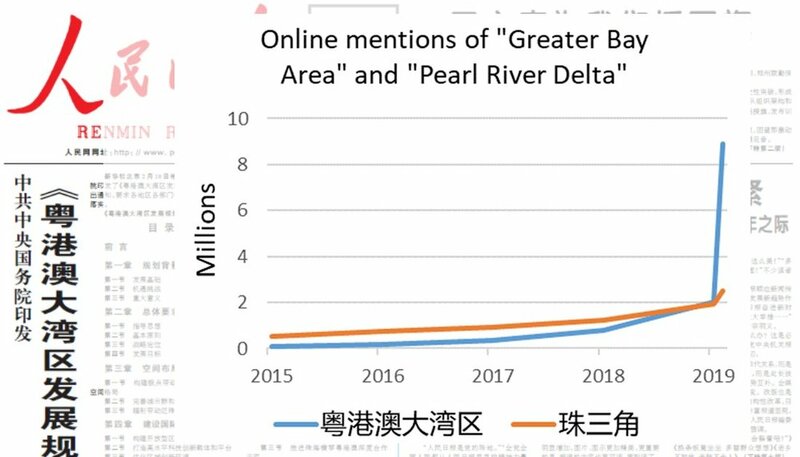 Versions of “珠三角”, such as “珠江三角洲”, are not included in the search since the main purpose of the figure is to show the surge in the use of the term “Greater Bay Area”.